Microsoft's attempts to catch up with Google in the online collaboration space took a step forward Wednesday, when the company announced that it's giving business users live chat in Office Online. The new feature will allow users to discuss documents stored in SharePoint and OneDrive for Business using chat sessions powered by Skype for Business. When more than one person is working on a shared document inside Word, Excel, OneNote or PowerPoint Online, they'll see a chat button show up in the Web app's toolbar. When clicked, it'll open a chat sidebar so everyone with the document open can discuss it. 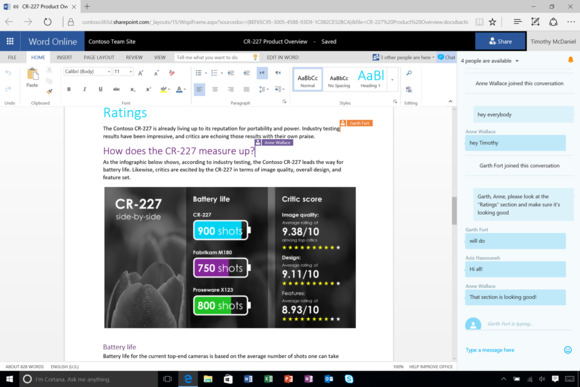 It's an enterprise-grade improvement to the Skype chat Microsoft already offers for consumers using Office Online, as part of the company's push to better compete with other productivity suites that feature real-time collaboration. Skype for Business chats compliment other functionality in Office Online, like support for real-time co-authoring of documents shared between users. The chats aren't designed to replace traditional document collaboration tools like leaving comments and tracking changes, but they can help a team of people all looking at the same document to better work together in a more rapid-fire way. It's a feature that has been core to Google's Docs productivity suite for quite some time, and this update means that businesses using Office 365 have another reason to consider sticking with Microsoft rather than switching to one of its competitors. Microsoft has recently rolled out a number of other updates to Office, including new watch face support in Outlook on Android Wear and the launch of SharePoint for iOS, which the company announced earlier this month. In addition, Microsoft is offering discounts for consumers who want to buy either Office 365 Home or its subscription-free Office Home and Student 2016 software.